The founding of California Polytechnic State University, with its “learn-by-doing” philosophy, began when local journalist Myron Angel gathered a group of citizens in 1894 to lobby for a state school in San Luis Obispo. On March 8, 1901, Governor Gage signed legislation to establish the California Polytechnic School. On a visit to San Luis Obispo on May 9, 1903, President Theodore Roosevelt praised the citizens for their support of the state school. The first classes met October 1, 1903. Beginning as a co-educational vocational school during the Progressive Era, Cal Poly has become the country’s leading undergraduate university in the West. By the time Robert Weir Ryder was appointed director in 1914, students of the Polytechnic School had formed the first student body association, and the campus had celebrated the combination annual picnic and Decennial, bringing 3,000 visiting students back to campus. The Poly P, one of the oldest hillside initials in the West, has always been an important part of Cal Poly history, from its stone-and-lime origins in 1919 to the use of whitewashed barn doors by the Rally Club in the 1940s, to its present concrete form. See an in-depth timeline of Cal Poly history here. In response to state legislation, compulsory military training for men was instituted in 1915-16, and in 1917-19 enrollment dropped as students enlisted to fight in World War I. In 1930, the state legislature excluded women as students. 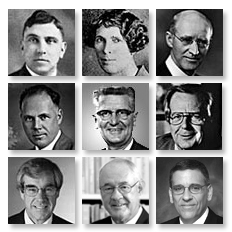 Julian McPhee’s long and eventful presidency began in 1933 and the institution struggled to remain viable in the face of uncertain funding. In 1938, Cal Poly received its first million-dollar gift when Charles and Jerry Voorhis donated their Southern California ranch for use as a horticultural training center. In preparation for World War II, Cal Poly’s Rosie the Riveter training programs were set in motion, and Navy pre-flight training began in 1942. After the war, Cal Poly expanded as World War II veterans enrolled under the G.I. Bill, with on-campus housing made available at the married student village, Vetville. In 1949, cereal magnate W. K. Kellogg donated his Arabian horse ranch to Cal Poly, and the Pomona campus came into being (now Cal Poly Pomona). In the same year, the San Luis Obispo and Pomona campuses combined forces to produce the first Cal Poly float for the Tournament of Roses Parade in Pasadena. 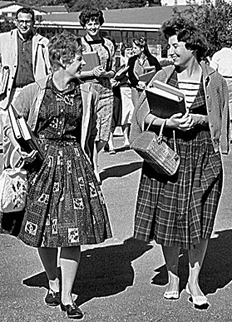 In 1956, women were once again admitted as students at Cal Poly. Cal Poly’s darkest hours were in the aftermath of the 1960 crash of the plane carrying the college’s football team. Sixteen Mustang football players, the student manager, a member of the Mustang Booster Club, and four others perished on October 29. Of the forty-eight persons aboard the chartered aircraft, another twenty-two were injured, some gravely. In 1966, after 33 years as Cal Poly’s leader, President McPhee retired. Robert E. Kennedy succeeded him, ushering in a period of remarkable growth and expansion. The arrival of President Warren J. Baker in 1979 continued the success of Cal Poly and its learn-by-doing philosophy. For the 2001 Centennial celebrations, the first book-length history of Cal Poly was created. Cal Poly: The First Hundred Years features 320 illustrations from all decades of campus life. Copies are available in Special Collections and Archives and the main collections at the Kennedy Library. Sunny Wednesday! It's 12:48am right now.